Does your little one have a favourite doll, teddy or stuffed toy? You can help them bring their cuddly companion to life with the aid of our dolls furniture and accessories. Our range includes stunning beds and prams, teapots and tents from brands like Maileg, Smallstuff, Sylvanian Families, Bloomingville and Cam Cam Copenhagen. You’ll find large furniture for their favourite dolly or teddy, through to small pieces that are the perfect size for a doll’s house. All you need to do is pick the size to suit your little friend. Each piece from our collection of furniture and accessories for dolls has been stylishly designed and expertly crafted with meticulous attention to detail. 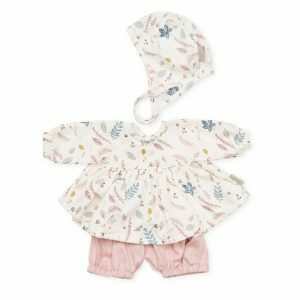 A cute set for dolls. 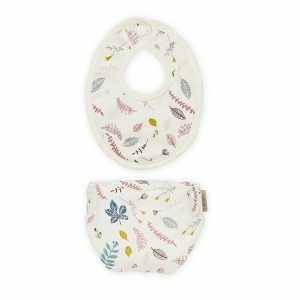 The set includes a diaper and a bib, both made of soft organic cotton with delicate Cam Cam print. 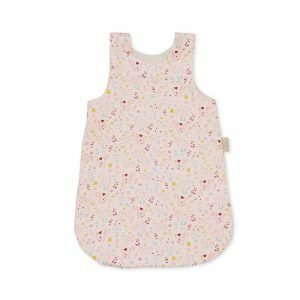 Both items have easy closure, so it is fast and easy for the child to take on and off. The set fits the most popular dolls on the market. The doll's carrier is a fun way for your child to carry their favourite doll around, and it is a fun way to imitate their mother or father. 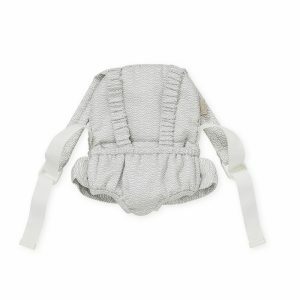 The carrier has adjustable straps and velcro straps around the belly to adjust the size. Both front and back position are available. The carrier the most popular dolls on the market. A great gift idea for the older sibling. The Doll's Carrier is delivered in a pretty gift box. The clothes fits the most popular dolls on the market. The set is available in different Cam Cam prints and delivered on a small, practical hanger. The doll is sold separately. Sweet dreams! The sleeping bag is cute and ideal for tucking in favourite little dolls or teddys, or to bring along on-the-go. 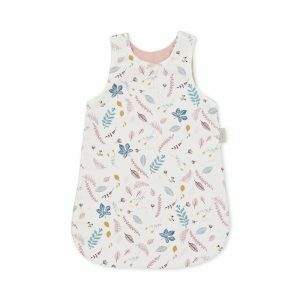 The sleeping bag has beautiful printed fabric on the outside, and soft baby corduroy on the inside. It is closed with brass push-buttons. The sleeping bag is a must have toy accessory, and nice gift idea for little girls or boys. 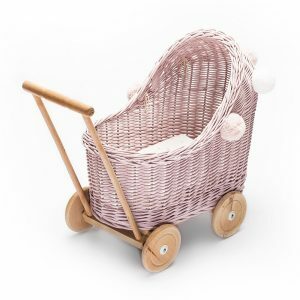 From the wonderful world of Lilu, we have a gorgeous collection of wicker prams direct from Poland With their durable design, adorable muslin bedding and sweet little pom pom details, we're sure that your little one will love and cherish these stunning toys, even when they're fully grown! The paints used are water based with no solvents added which means they're safe for your child and kind to the environment. Each pram comes with cotton muslin dolls quilt and pillow as well as decorative pom poms (as pictured) which can be removed. Recommended for use inside only. Dimensions: H: 58 cm W: 27 cm L: 48 cm. 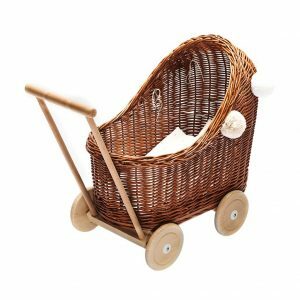 Materials - Pram: Wicker & Wood. Dolls Bedding: 100% Cotton Muslin with Deluxe Silicone Anti-Allergen Filler. THIS IS A PREORDER ITEM WITH AN EXPECTED ARRIVAL OF NOVEMBER 2018. From the wonderful world of Lilu, we have a gorgeous collection of wicker prams direct from Poland With their durable design, adorable muslin bedding and sweet little pom pom details, we're sure that your little one will love and cherish these stunning toys, even when they're fully grown! The paints used are water based with no solvents added which means they're safe for your child and kind to the environment. Each pram comes with cotton muslin dolls quilt and pillow as well as decorative pom poms (as pictured) which can be removed. Recommended for use inside only. Dimensions: H: 58 cm W: 27 cm L: 48 cm. 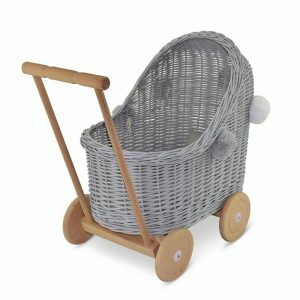 Materials - Pram: Wicker & Wood. Dolls Bedding: 100% Cotton Muslin with Deluxe Silicone Anti-Allergen Filler. From the wonderful world of Lilu, we have a gorgeous collection of wicker prams direct from Poland With their durable design, adorable muslin bedding and sweet little pom pom details, we're sure that your little one will love and cherish these stunning toys, even when they're fully grown! The paints used are water based with no solvents added which means they're safe for your child and kind to the environment. Each pram comes with cotton muslin dolls quilt and pillow as well as 3 decorative pom poms (as pictured) which can be removed. Recommended for use inside only. Dimensions: H: 58 cm W: 27 cm L: 48 cm. Materials - Pram: Wicker & Wood. Dolls Bedding: 100% Cotton Muslin with Deluxe Silicone Anti-Allergen Filler. THIS IS A PREORDER ITEM WITH AN EXPECTED ARRIVAL OF NOVEMBER 2018.